Hey there. I am Verena. 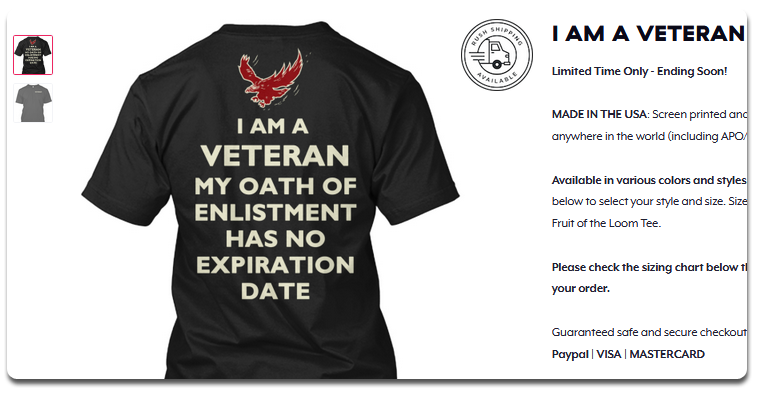 Above is a screenshot of one of the t-shirts I sold on Teespring during my free time. I netted $1739.17 with the ugly shirt which took me 30 minutes to design. Not bad for a side campaign huh. The Warrior Forum does not allow income screenshots. If you want proof, PM me and I will send it over. Selling courses is just one of my side businesses. I have a couple more of these, each producing a steady stream of cash every month to my PayPal account while I run my web design business full time. The thing they have in common? They are all small in scope and simple to implement. Plus, they are low maintenance. Even busy people like me can still find time for them. You'll have access to everything you need to grow your income using the Internet from scratch to your first $10,000, even if you have a 9-5. I will show you all the business models you will use to achieve it, how you can set them up and strategies to get them to work for you. They are in my private membership site. For 3 months, you will get to see a new online business model in my exclusive membership area. One business model a month. You will get a full breakdown. The business, the strategy involved, the approach, the big idea behind it all and best of all, step-by-step instructions on how to get it up and running. These businesses work for marketers at any skill level. You do not ever have to worry about being a tech-challenged, have-a-day-job, doing-everything-all-by-yourself solopreneur. I made money with these businesses in the same way I will teach you to run them. You only need to pay a small fee of $39/month to access the materials. #1: Sign up now for $1, you will get to access the first business model instantly. #2. If you are happy with what you get, you will be billed $39 seven days later. #3. For $39 a month, you will receive one new business model every month in your membership area for a total of 3 months. #4. You can cancel at any time. Just drop me a line at verena@growthtext.com and I will cancel your subscription right away. Easy! Invest only $39/month to get access to the exact, solidly profitable business models I use to make 5 figures a month. If this is not an insane bargain for you, I do not know what is. By the way, even your $1 is 100% satisfaction guaranteed. Click the button below and I will see you inside. Last edited on 11th Apr 2019 at 07:33 PM.